70 Years of Nakba: Take the Streets for Palestine - March for Return! Samidoun Palestinian Prisoner Solidarity Network urges all supporters of Palestine and the freedom of Palestinian prisoners to participate in the events and actions around the world commemorating the 70th anniversary of al-Nakba and supporting the #GreatReturnMarch in Gaza. For 70 years, Palestinians have faced ethnic cleansing, forced displacement, massacres, imprisonment and racist oppression – a continuation of the previous 30 years of British colonization. Those past 70 years have also been years of resistance, organizing and struggle for the liberation of the land and people of Palestine. Imprisonment has always been a part of the colonial weaponry used against the Palestinian people. From the imprisonment of Palestinians by the British colonial authorities – which inspired some of the songs and poetry that still remain symbols of the Palestinian prisoners’ movement today – to the imprisonment of thousands of Palestinians and the use of forced labor camps during the Nakba, prisons and resistance to them have been a part of the Palestinian liberation struggle. As the Nakba continued, Palestinians struggling to return were labeled “infiltrators,” killed and imprisoned by the Zionist state. Throughout 70 years of struggle, the leaders and organizers of the Palestinian people – fighters, labor organizers, teachers, poets, writers, student and women’s movement leaders, farmers, workers, fishers – have been imprisoned in their hundreds of thousands by the Zionist state and have continued their resistance. The prisons have become symbols and spaces of oppression and also places to organize resistance, educate young people and build revolutionary schools to develop the struggle. Today, 49 Palestinians have been shot down in the Gaza Strip at the 1948 armistice line, delineating the arbitrary enclave into which Palestinian refugees were ethnically cleansed by Zionist militias, and later the Israeli army, where they have gathered as part of tens of thousands participating in the Great March of Return, demanding their right to return to their homes and lands and the breaking of the siege on Gaza. As Palestinians mark 70 years of ongoing Nakba, they will march again facing brutal live fire and repression that has severely wounded thousands. 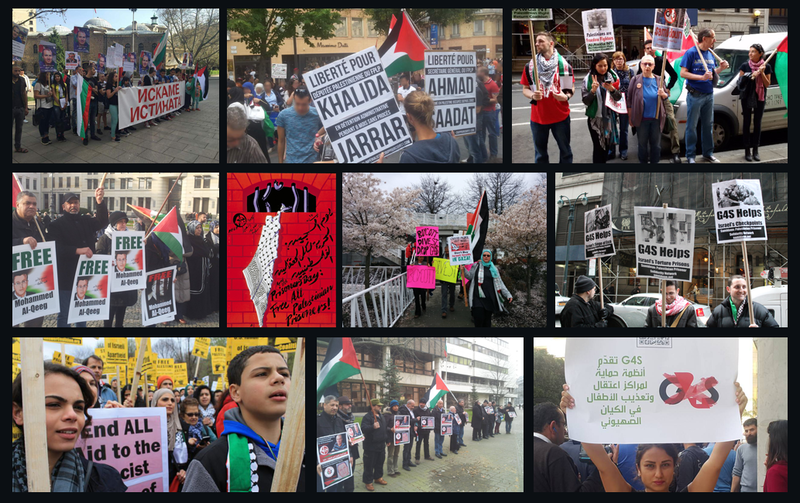 To support the march for return on the anniversary of the Nakba, broad participation in the numerous events and actions around the world is essential. Samidoun Palestinian Prisoner Solidarity Network urges supporters of Palestine around the world to mobilize on the anniversary of the Nakba to march alongside the Great March of Return and the millions of Palestinian refugees in exile and diaspora who struggle for their right to return home, the key to Palestinian liberation. Send your events and actions to us at samidoun@samidoun.net or on Facebook to tell us about your actions in response to the Land Day Massacre and for Palestinian Prisoners’ Day. See our constantly-updated calendar of events! The following signs can be used in your own local events and actions. PDF download links are provided below! Copenhagen: 70 Years – We will never forget al-Nakba! Detroit: Nakba Day – Jerusalem is (still) the capital of Palestine! Aalborg: We will never forget al-Nakba! Manchester: Solidarity with Student Prisoners! Resist political detention! Bologna: Enough of the Israeli crimes! Lille: Stop the Massacre in Gaza! Pensacola: Pensacola Stands for Palestine! Catania: Stop the Massacre in Palestine! Bonn: 70 years of expulsion and occupation are enough! London: End British Support for Israel! Solidarity with Gaza! Hamburg: Freedom for Palestine – Stop the Massacre in Gaza!